I wrote about my experiences with Brain Fog earlier on this blog. It’s still happening, and probably increasingly so (both in frequency and severity). 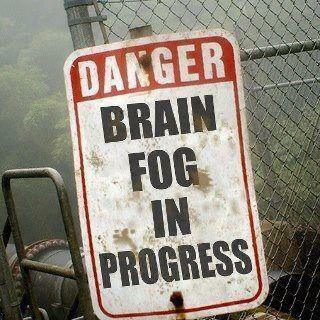 Another way the [central nervous system] can be affected is by brain fog. This is a condition that most people are familiar with, and yet there is no medical term for it and it cannot be researched by putting ‘brain fog’ into an Internet search engine. The closest term would be ‘mild cognitive dysfunction,’ but this encompasses a wide spectrum of often subtle changes. 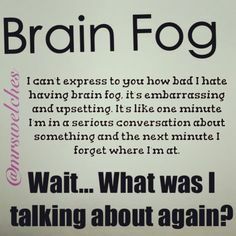 Brain fog is often experienced as problems with memory or difficulty focusing or problems with processing information or numbers or with paying attention. It is an experience of feeling not quite ‘all there’ mentally. During my two week blast trial of prednisone after going to Philly in mid-December, brain fog was one of the areas in which I had a noticeable improvement. And after the two-week prednisone trial it came back just like before. Therefore, it’s being caused by the inflammation that’s going on in my body due to Sjogren’s. “Dr. D” in Philly wanted me to have a neuropsych evaluation done to attempt to quantify the “brain fog” so that we can determine if the immunosuppresent (Imuran) that he prescribed helps it any. So I couldn’t start the Imuran until after I had the neuropsych consult in case it started to help and we didn’t get a good baseline. The results show I still have my high IQ – I’m still the “smart girl” – but I had noticeable problems with processing ability and memory, especially when compared to other people with similar IQs. Severe impairment in mental control, i.e., ability of holding information in working memory for mental manipulation. Moderate impairment in sustained attention. Mild to moderate impairment in memory. The impairment was marked by decreased ability of encoding new information and retaining newly learned information over time. The patient showed more impairment in visual memory than verbal memory. So the first three pretty much describe exactly what Dr. McDermott described in the quote from her talk. Yep, that just about sums up what I’ve been describing to doctors – including the ones at KU Med (“Dr. C” and “Dr. N”) that wrote of my brain fog as not important or in my mind. The last one validates exactly what I’ve been describing with my hands (see my first post here and another post about it here…I’ve mentioned it in many other posts but those are the two that are pretty focused on just my fine motor skill issue). I’ve always called it “Fine motor control issues” despite “Dr. C” continually referring to it as burning/tingling/falling asleep. It’s motor control – not peripheral neuropathy. It is unbelievably satisfying and validating and an immense relief to have what you’ve been describing to people for years validated by objective assessment. These things are truly going on with me. They’ve been measured and documented. The only problem is that they have to take my word for it that these things weren’t going on with me my entire life because we can’t go back and do the testing before the symptoms began – we don’t have a true baseline from before the disease process began. But I know they weren’t previously. I know without a doubt I had better fine motor control. I know that I used to have much better processing ability and memory.